2017-11-15 - Make A Wish!!! It was a private event at Legal Draft this Wednesday night. The night was honoring those who were impactful in the Make-A-Wish foundation fundraiser. The crowd was raucous and ready for some awesome trivia. With every question, no matter how easy or difficult, the crowd was excited to let everyone within earshot of Legal Draft know how much fun they were having playing trivia with the PubGuys. As usual, the folks at Legal Draft provided some fantastic beers, including several rare drafts that are featured only in the taproom. They also had Smokin' Joe's onsite providing some wonderfully tasty local BBQ. 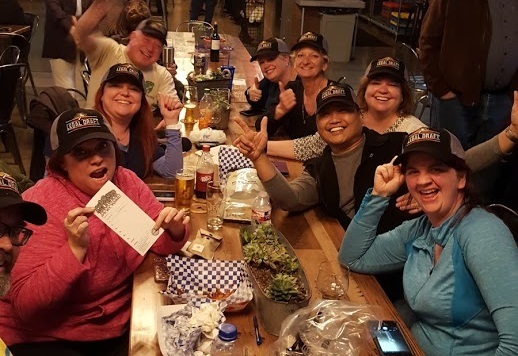 In the end, our winners were The Brewsual Suspects who managed to run away with the victory despite finding themselves in 3rd place at the halfway point. All in all, it was a fantastic night, and we truly appreciate everyone coming out for a great cause. Thanks again to Victoria and Legal Draft for being such great hosts!